Throughout the summer months (and sometimes into the winter as well), we attend village fetes and agricultural shows to raise the funds our group requires to pay for any vets bills we may incur, any equipment we may need, and also to enable us to support the Badger Trust and Secret World in Somerset where rescued cubs are looked after. As important as raising money, is the need to raise our profile, and it is at these shows that we are able to reach the public and in turn for feeding them more information about badgers, we sometimes gain valuable information regarding sett locations, and road casualties. We are also sometimes lucky enough to recruit some very good new members at these shows! 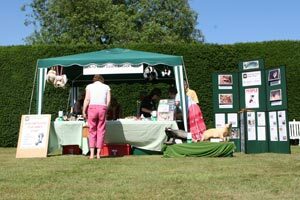 We also hold collections at supermarkets, do car boot sales, and hold different fundraising events in aid of the Badger Trust's annual badger day. If you see us at any event, please come over and say hello. We would be glad to give you any leaflets or advice or speak to you about more of our activities. One of our aims, as a group is to educate the general public (of all ages), in all aspects of badger lifestyle, care and protection. We offer an excellent PowerPoint illustrated talk to anyone who will listen! we do normally ask for a £50 donation but please ring for concessions for children. While the adult talk contains some graphic images of snared and injured badgers, it can be tailored to cater for all age groups and most definitely has the AAAH factor! 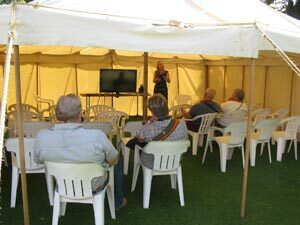 The talk is given by an experienced, knowledgeable member of the group who will do their best to answer any questions posed at the end of the session. Often the most challenging questions come from the youngest members of the audience! Two of our members chose to undertake a cycle ride from Braintree to Sudbury and back to highlight the cull of badgers in Wales. 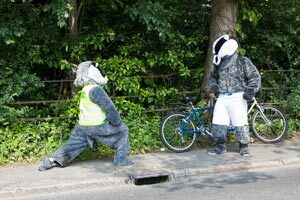 They chose to do this on the hottest day of the year - on a tandem and dressed in badger suits. Along the route they were greeted by much honking of car horns and cheering. They made the local papers and raised around £500 in the process. 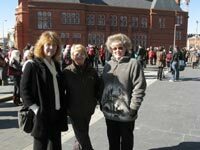 Some of our members travelled down to Wales to join the protest outside the Welsh Assembly building. As it turned out on the day - the Welsh Assembly staff were on strike! Eventually, and at great expense to Badger Trust, the proposed cull in Wales was abandoned due to a legal technicality. The threat to cull badgers continues though in a futile attempt to eradicate bTB in cattle. Monitoring of setts is one of our most important (and enjoyable) activities. 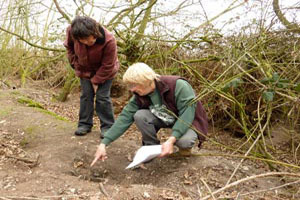 We aim to visit each sett in our area (and there are hundreds that we know of!) at least twice a year. It is often easier to visit in the winter months when undergrowth is less dense and access to setts is therefore easier. We look for signs of recent badger activity, badger sett entrances (in use and disused), spoil heaps and badger hairs, scratching trees, latrine pits, badger paths and footprints. All of these signs represent a sett in current use and are recorded. These records are kept by the group, both in paper form and on computer. 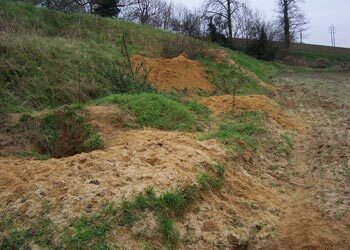 The records are vital evidence and have been used to help prosecute perpetrators of sett damage and badger persecution. Many members have their ‘own’ setts to look after and there are always plenty to go round. As an active member within the group, you could be helping us with this vital task. All the above images are signs you may find while sett monitoring. In order, left to right - spoil heaps, badger paths, footprints, dung pits, badger hairs, badger gathering bedding and a scratching tree. You may also be really lucky and see adult and/or badger cubs! 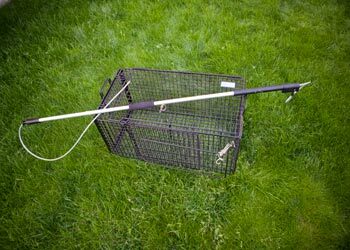 The NEEBG has provided several experienced members with the necessary equipment to collect and contain any injured badgers. All members agree that the most rewarding and enjoyable sight we see is the rear end of a badger which has been treated and is heading back home.The main reason for having to use this equipment is to safeguard the health and well-being of both the badger and rescuer. Badgers have extremely strong jaws and formidable teeth. They are capable of inflicting serious injuries and should never be handled by inexperienced though well meaning people. Often seemingly unconcious badgers can revive quickly and should never be placed in the boot or back seat of your car unrestrained! 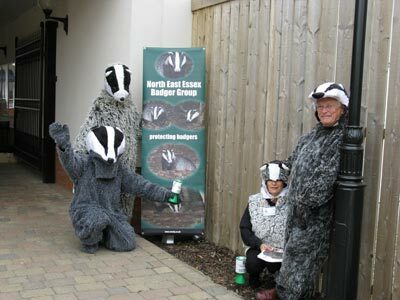 The North East Essex Badger Group is affiliated to Badger Trust which is a Reg Charity No 1111440.